Joe Fox is the new coordinator for Gallery Route One’s Artists in the Schools program, replacing Madeline Hope who will continue to work in the program. Joe, who lives in Point Reyes, is also a new artist member of Gallery Route One. >The Makers elective at West Marin School has begun and I’ve been working with Julie Cassel on project plans for small, simple motorized bots that can be used to produce drawings and works on paper. We may be doing a photo based project with a small group of students who expressed interest in photography, possibly documenting the Makers elective with still and video. We’ll also continue shaping the space with additional tools, materials, work-benches and more. >Felting with 3rd grade will probably be in the spring or possibly after winter break. >Plastic mosaic project with 5th grade, using plastic bottle tops to make a two part piece that can be displayed at Inverness and West Marin Schools, as well as Toby’s, for the end of year show. Joe also hopes to continue the work that Madeline Hope started with Lagunitas and Nicasio schools. 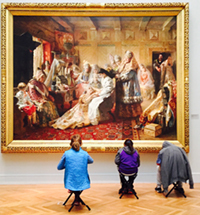 Photo: Sixth graders from West Marin School visit the De Young Museum, 2016.